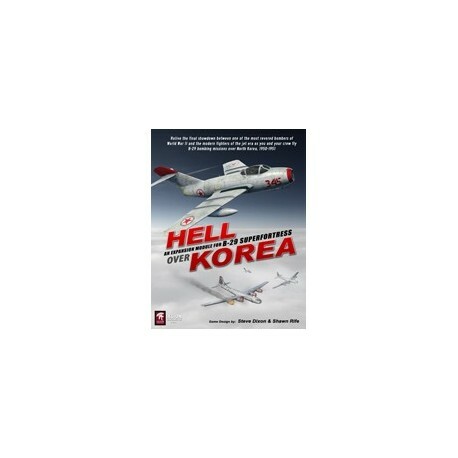 HELL OVER KOREA is and expandion module for B-29 SUPERFORTRESS covering B-29 missions in the Korean War from November 1950 through April 1951, covering a standard six-month bomber crew tour of duty in Korea. 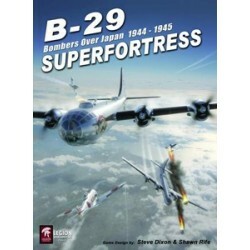 NOTE: YOU MUST OWN A COPY OF B-29 SUPERFORTRESS TO PLAY HELL OVER KOREA. B-29. Early missions (i.e., before November 1950) for the bomber met with little enemy opposition, with (relatively ineffective) raids against tactical targets. North Korea's few strategic targets and industries were also quickly disposed of. In November 1950, however, the Chinese Communists were in the war, and the B-29 began facing its first serious opposition with the introduction of large numbers of Soviet MiG-15 jet fighters. It was now a real contest. However, the MiG-15 had been specifically designed to shoot down B-29s and the aging Superfortresses were outmatched by the jet, even with fighter escorts. Aircraft losses would soon restrict most B-29 missions to night-only attacks, largely in a supply-interdiction role. the Soviet Union and China.